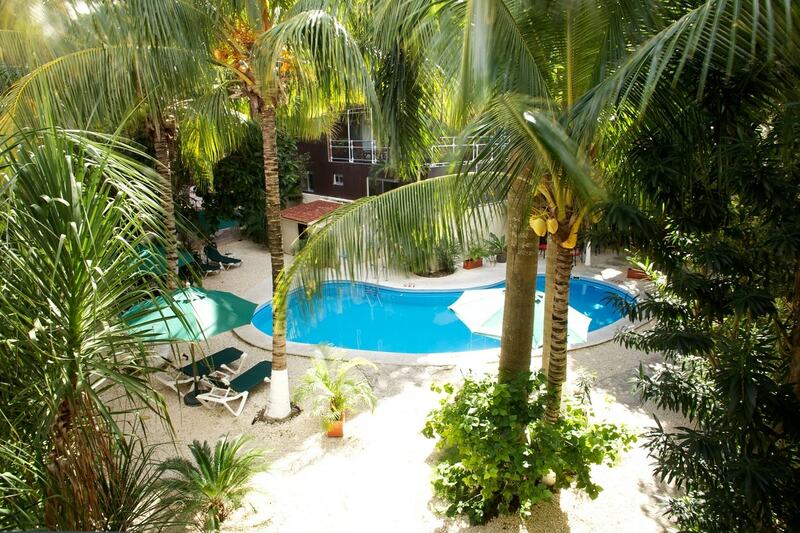 This affordable boutique hotel offers comfortable rooms, great service and is in the heart of Playa del Carmen. In a great location, just minutes’ walk to the white sandy beaches and the famous Fifth Avenue strip. Step into the charming courtyard gardens, take a refreshing dip in the pool or enjoy the chirping birds from your balcony or terrace. Each of the 33 bedrooms at the Hacienda Paradise are beautifully decorated. Spanish Colonial architecture ads to the warmth of the room and invites you in. Connecting rooms are available for families and all rooms have either a balcony or a terrace. Every room has a safety deposit box that can fit a laptop, and the phones have VOIP service which allows for low-cost phone calls. The Hacienda Paradise hotel has the “Nuestra Casa” breakfast option on site. Enjoy homemade and healthy options as well as eggs and Mexican specialties at the garden restaurant. In Playa del Carmen, you can dine around the world. By staying at the Hacienda Paradise hotel you will be steps away from all the choices that the town has to offer. Authentic Italian, Greek, Mexican, American and Asian options abound. Check out our list of the best restaurants in Playa del Carmen. There are choices for every taste and budget. The hotel concierge can help you arrange for a bike rental in Playa del Carmen. You can also book tours and activities on site. You are steps away from Mamitas beach club that offers water sports rental options. Less than 5 minutes away you will find the Playa del Carmen sports complex where you can take advantage of tennis courts, basketball courts, a track and more. The hotel has agreements with several of Playa del Carmen’s best beach clubs including Indigo, Mamita’s and Zenzi. The hotel offers a selection of spa therapies on site. Thinking of a destination wedding in Playa del Carmen. Let one of the wedding specialists help you plan your perfect day. Just get in touch! The Hacienda Paradise hotel offers a pet-friendly suite with extra amenities for your furry family member: a doggy bed and pet blankets; bowls for food and water; a leash; treats and even waste removal tools. Dog walking and dog sitting can also be arranged through the local Dog Holiday service.